Origin and Habitat: Proiphys amboinensis is considered native to Thailand, Indonesia (Maluku, Sulawesi, Bali, Lombok, Timor), the Philippines, the Bismark Archipelago, Vanuatu, New Guinea, Queensland and Western Australia. Is also naturalized in Seychelles, Sri Lanka, Solomon Islands, Niue, Society Islands, Caroline Islands and Mariana Islands. Occasionally cultivated elsewhere. Habitat and ecology: This species occurs naturally in colonies in light shaded areas of the rainforest or in open forest bordering rainforest regions and coastal areas. Description: Proiphys amboinensis (syn. Eurycles amboinensis), commonly called the Cardwell Lily, is a peculiar bulbous herb that produces nearly circular leaves followed by attractive scented white flowers with yellow throats. The larger leaves can be over 25 cm long have a leaf stem up to 50 cm long. 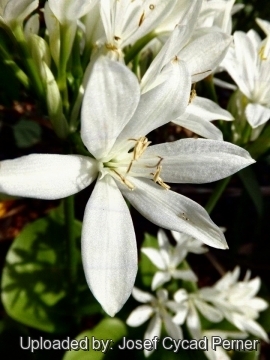 The pure white, fragrant flowers are 5 cm wide each with up to 18 flowers in a umbel-like cluster on stalks over 50 cm long. They open in succession over a prolonged period and last well. It is one of the most attractive in the genus. Plants die back to an underground bulb during winter and should not be disturbed at this time. Derivation of specific name: “amboinensis” - from the island of Ambiona, now Ambon, an Indonesian island. Bulb: 3-6 cm long, 4-6.5 cm wide, ovoid. Leaves: Radical, petiolate, large, erect 30-90 cm tall, broadly heart-shaped, subcircular, elliptic or kidney-shaped. Petioles stout 15-40(-60) cm long, 0.4-0.9 cm across. Lamina, bright green, glossy 18-35 cm long, 15-35 cm wide, with symmetrically parallel curved venation. The leaves die away in the dry season. Inflorescences Umbellate on (10-)30-50(-90) cm long lowering stem (scape), 5-25-flowered. Spathes 2-4. 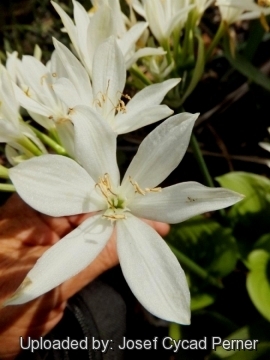 Flowers: Pedicellate, 2.5-4 cm long, 4-4.5 cm wide, erect, nearly flat, white, fragrant, each lasting 2-4 days. Tepals united into a narrow tube; segments subequal, erect to patent, elliptic to obovate, apiculate. Stamens inserted in the throat, basally connected by a thin membrane (false corona about 0.9 cm long) which is sometimes 1- or 2-toothed between the filaments; anthers dorsifixed. Style filiform; stigma entire. Fruits (loculicidal capsules): 3-valved, irregularly oblong, green-yellow to blackish, 3-4 cm long, 1-2(-3) cm across. The capsules that develop on the flower heads often germinate on the plant (new plants can be grown from these). They contain one to several fleshy seeds. Seeds: Angular by pressure, black. 2) Wikipedia contributors. "Proiphys amboinensis." Wikipedia, The Free Encyclopedia. Wikipedia, The Free Encyclopedia, 7 Apr. 2015. Web. 13 Sep. 2015. 3) Fay, Michael F. and Mark W. Chase. “Resurrection of Themidaceae for the Brodiaea alliance, and Recircumscription of Alliaceae, Amaryllidaceae and Agapanthoideae.” Taxon 45 (3):441-451.1996. 4) Beasley, John. “Plants of Tropical North Queensland: the Compact Guide.” Footloose Publications, Kuranda. 2006. 5) Effie Mullins, ANBG (1989) “The genus Proiphys -Previously known as genus Eurycles” Last updated: 22 May, 2013, Australian National Botanic Gardens and Centre for Australian National Biodiversity Research, Canberra. Web. 13 Sep. 2015. 6) Scarth-Johnson, Vera. “National Treasures: Flowering Plants of Cooktown and Northern Australia.” Vera Scarth-Johnson Gallery Association. Limited Edition - Leather Bound. 2000. Cultivation and Propagation: The Cardwell Lily, Proiphys amboinensis, is a fine bulbous plant not widely used in horticulture, yet the large, deeply-veined leaves which are produced on long petioles make them desirable garden subjects. 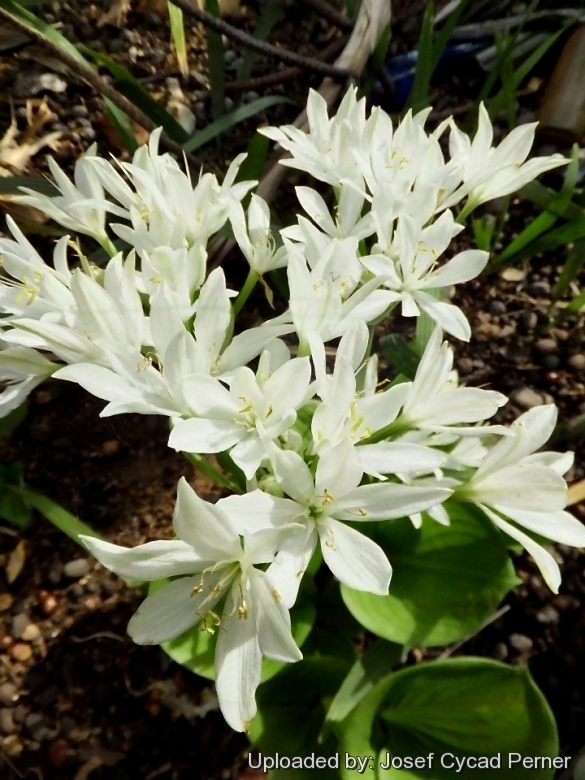 The heart-shaped, almost evergreen leaves of this lily are almost as decorative as the white flowers, and it is surprising that the plant hasn't found more favour in gardens and greenhouses than it has, especially as it is believed to bring good luck to its owner. It presents no great difficulty in cultivation. Proiphys are ideally suited to warm frost-free areas and can be grown in a rockery, beside a garden pool or in pots or tubs in cooler regions. They are hardy and easily grown although development to the flowering stage is slow. It is believed to bring good luck to its owner. Soil: They do best in well composted soil in sheltered areas of the garden with little sun. It needs a slightly acid deep, rich soil comprising equal parts of well decomposed compost, and river or silica sand (or pumice). Planting: Plant the bulbs with the neck just below soil level and can remain in the same position for many years. Grows it in pots with a diameter of at least 25 cm. Give it excellent drainage. It prefers regions with dry winters or, in wetter areas, to be planted in well-draining sandy or gravelly soil or even on a slope. The bulbs may be taken up and dried in autumn and planted again at the latter end of February or beginning of March they may be made to flower readily in pots if the leaves are allowed to perfect themselves and the bulbs are afterwards kept dry and warm for a few months through the winter Under these circumstances the flower stems are produced upon the application of water in the ring. Exposure: It is most suitably grown in full sun but it will even grow and bloom in half shade too. Hardiness: They are sensitive to frost, but are said to be hardy -5° C (or even less). Zones: 8-10. Garden uses: In warm and temperate climates grow it sunny courtyard gardens, in raised beds. In countries with cold winter climates, they are best grown in containers in a cool or slightly heated greenhouse. Uses: Leaves chewed to cure swellings and to obtain relief from pains, rheumatism and aches. Bulbs emetic, cathartic. Magic, possession, sprinkle water with leaves about the house to ensure that a spirit will not haunt it.